Kitchens are traditionally the heart of the home. When we welcome guests into our homes, our first stop along the grand tour is almost always the kitchen. We offer our company drinks, we take their coats and we gather around a table or counter space to catch up. But it’s not just for guests. The kitchen is where the family comes together. Mealtimes, homework, planning vacations—these usually all take place en la cocina and the kitchen is frequently the last room we occupy before we leave the house. Which is why your home design must take this into account. To that end, a kitchen must be equally functional as it is welcoming. When remodeling your kitchen try incorporating surfaces such as countertops, breakfast nooks or islands that serve both a culinary or preparatory function but also help to foster open communication. Embrace diversity in texture by pairing rough-hewn floor surfaces with warm, inviting cabinet space. Make the space pop by staying conscious of color. Paint the walls a soft hue of yellow, pink or blue and accentuate with fresh fruit bowls and colorful glass kitchenware. The rule of thumb: Lighting is key! Not only do we need enough light to safely cook and prepare meals, a dark kitchen inhibits open communication and can create a sullen mood. An overly bright kitchen can feel clinical. Go for soft, warm lighting that can be dimmed for romantic meals and turned up when the kids have their friends over for pizza! 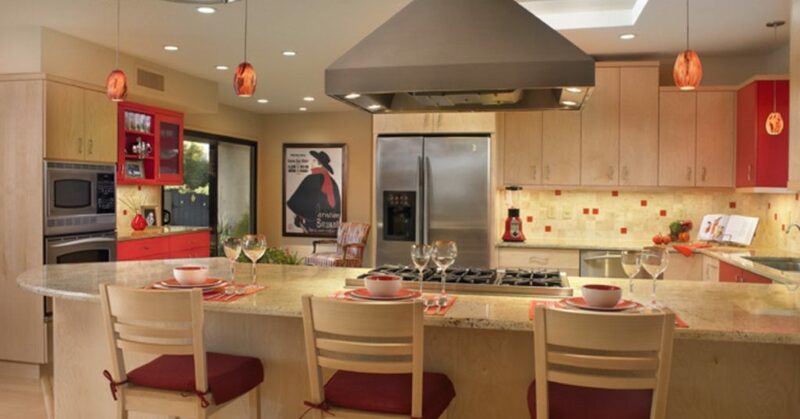 Something about your Kitchen you absolutely love or hate? Let us know in the comments below.